This week is Random Acts of Kindness week, which means... go out there and be nice! You don't have to spend money to share love and positivity. Here's a list of of things you can do this week, to spread kindness for free. 1. Open a door for a stranger. A smile can make a person's day plus it's contagious! 3. Give a random stranger a complement, of course, mean what you say. Isn't is nice to hear: I love your hair or that's a nice shirt? 4. Compliment a child's behavior. If you see a well behaved child, let their parents know-- it takes a village. If you give that compliment I'm sure not only will the child appreciate it, his or her parent will too. Many times we clip more than we need, why not share. Leave coupons next to items you don't need or want. Do you have a free Redbox code? Share that code with the person behind you. If nobody is behind you sticky notes work too. 7. Let a person cut in front of you. If you're anything like me… you may have a tinsy little problem with collecting reusable bags.. eh hem. Well, if you have that addiction same affinity for reusable bags as I; why not share one with a stranger who's fumbling around with arms full of groceries trying to Rachel Ray it? Donate your old clothing, blankets, or furniture to shelter or non-profit in your area. Super easy. Go out there and say Hello to random strangers. 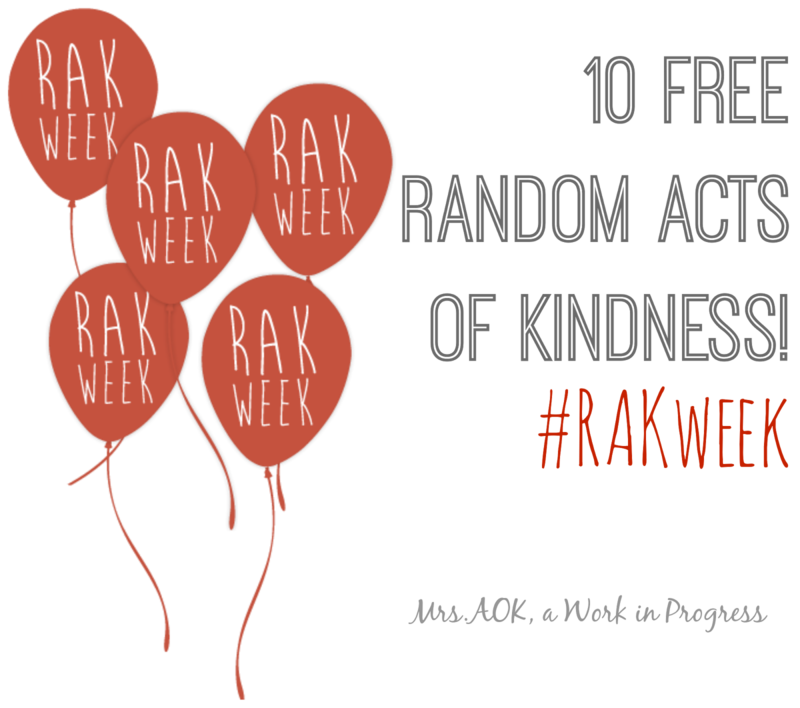 BONUS: RandomActsofKindness.org is sharing downloadable bookmarks and cards for you to share. Also, my super sweet friend with a humongous heart is also sharing a great list of RAK.